Added 12-22-07: Photograph of SC 130 crew and band members, courtesy of Woody Hughes. Elwood T. Hughes served as quartermaster on submarine chaser SC 130. After the Armistice, this chaser was among those assigned to serve along the eastern coast of the Adriatic Sea. Their mission was to receive surrendered Austrian war ships, perform various duties along the coast, and overall to help keep the peace amidst post-war tensions between the local Serbs, who wanted to form an independent state, and Italy, who wanted control of the region. This is a segment of crewman Hughes' personal journal, describing some experiences during his stay in the region of Spalato, Dalmatia. Thanks to Woody Hughes, son of QM Elwood T. Hughes, for submitting the transcribed journal entries to The Subchaser Archives. See a photograph of SC 130 here. Photo caption: "Out on the 'briney.' Not quite cold enough for windproof clothing, tho one of the fellows has it on. Adriatic 1918." 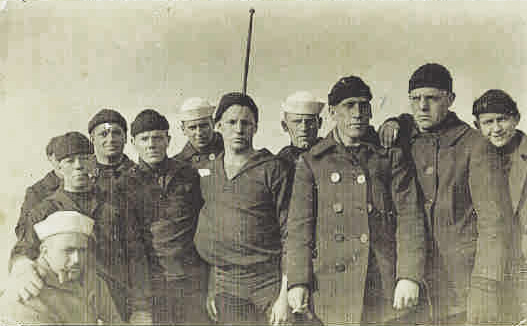 Elwood Hughes, father of Woody Hughes, is fourth from the left. Courtesy of Woody Hughes. Pelton, Porter, Havlicek and myself were transferred from the SC 130 on December 13th. Four men from each of chaser were placed on these ships and as we were the newest men on board, we were chosen. These ships were brought from Pola by the Jugo-Slavs a few days after the armistice was signed to keep the Italians from getting them and now we have two big white elephants on our hands. We will keep them until everything is decided in the Peace Conference. They are very dirty and we spend all of our time cleaning them up. About 260 men on each ship and two T. B.s with 8 men on each of them. Our only regrets at leaving the chasers were we had to leave our souvenirs behind and we may get them someday. Also our mail will be balled up and we may never get any more which is the hardest blow. We will miss the fellows especially some of them but between the two “chiefs” life was pretty miserable on board at best. Our work on them is finished now and we are looking forward to going home as soon as possible. A few days after we transferred, the chasers and Leonidas shoved off for Corfu. They are now in Malta getting ready for the trip home in the spring. Christmas was a dreary day on board. No mail or packages was the worst disappointment. We tried to get up an entertainment and invite the crew of the “Radetzky” over but all the fellows are so downhearted and blue that the plan fell through. This made the officers sore and they will rub it in on us from now on, if things could be any worse About fifteen of us who tried to start the entertainment were granted special liberty the day before Christmas and also Christmas day. This was a childish spite trick but we get so little liberty that we took this extra just to get away. I went on a church party in the morning but it didn’t seem much like Christmas. We visited a Catholic church but as we couldn’t understand a thing, left soon afterward. Rat, Bunny Holden and myself were taking a walk Christmas afternoon, bored to death with Spalato, when we saw a girl lean out of a very beautiful home and beckon to us. We went in and much to our surprise found her to be an American girl who lived in Denver, Colorado. Her parents died when she was very young and at the age of fourteen her aunt brought her to Spalato. Needless to say we camped right there for the rest of the afternoon and had quite an enjoyable time. She asked us many questions and seemed tickled to death just to be talking to us. She had been sick for quite a while and hadn’t been able to speak to any of the “gobs.” The Jugo-Slav and Italian question is the most important one to these people today and all their hopes are based on the Americans. If we leave, she says the people will be heartbroken. While we were there, her cousin came in to wait for her fiancée and then they were going to a dance. They wanted us to come with them but it was too late then and we had to go back to the dock. We made arrangements for the future, however and ought to have a good time if only they would give us more liberty. Once every ten days now that the war is over doesn’t seem very fair after going all summer without any and working the way we did on the “Barrage.” The chasers in England and France didn’t do half the patrol that we did and they would get two or three days furlough every time they came in besides night liberty when they were “standing by” for orders. As for the food we ate yesterday, the less said the better. Anyone who reads this book will think I am a chronic kicker, but if they could see or rather eat the stuff we are eating and hear the mutterings of the crew, they would know something was bound to happen. It is getting worse every day and half cooked black bread that we have to eat is making all feel miserable and sick. Oh well, let’s hope it will end some day and may that day be soon! Just tonight at chow, an officer passed through the mess hall and had to ignore the remarks about the navy, food and everything in general for he knew they were true. The officers’ galley is near ours so we know what they get to eat. Talk about your democratic Navy! As this is the first time in my Navy career that I have been in sick bay, I really must make a note of it. Just a slight case of Spanish “Flu” caused by a wonderful week-end party in Kastelstari. Brown, Morrow Eadeo, Wiseback, Rat, Bunny Holden, Piggy Sutton and myself to the six oared cutter after quarters Sunday morning and started for the town. We got some black bread, cocoa an a can of wienies for a lunch and the big day was on. The wind was blowing very hard in the exact direction we were going so it didn’t take us very long to make the 8 or 10 miles. Before we had gone a hundred yards we knew we couldn’t get back if the wind didn’t go down. We arrived at Kastelstari in about an hour, coming in on a wave that seemed as high as the roofs of the houses and received the usual welcome. The town turned out “en masse” and escorted us around until we began to get hungry. Bunny, Rat and myself could get along all right with them in German so we asked them to show us to an inn where we could get our chow cooked. A well-dressed young man stepped up to us and invited us to his home for there wasn’t a public house that was fit to go to, so he said. He lived in a beautiful home, well furnished, with his father, mother and sister and they certainly must have been wealthy from the way they lived. They cooked our cocoa and set out sliced beef, wine and white bread. Our black bread looked funny besides this. In the afternoon, we went to a dance and had a great time. Lots of pretty girls and their dances aren’t hard to do after you get used to them. We kept looking outside to see if the wind was letting up, but it seemed to be stronger all the time. It didn’t worry us any so we decided to stay all night. Franz Yvanec, the man who invited us to his house at noon, invited us all to his house for dinner. After that, we could dance some more and the matter of beds was easily fixed. Two or three of us went to stay at different houses. Roast turkey, cocoa, cakes, cauliflower, salad, bread and wine for dinner. Not very many people in Dalmatia have turkey and white bread and to us it tasted like a meal fit for a king. That night we danced until after midnight. I had an even better time than in the afternoon for I met a girl from Spalato who was not only good looking but we could understand each other in German. Slept between sheets for the first time since I left the States and on a real bed. A man by the name of Yusof took Bill Brown and myself home. Next morning the wind was still blowing too hard to row back so we started to walk after saying goodbye to all our friends and promising to come back again. Some of us got a ride part of the way and near Salona a big army truck took us into Spalato. Finally we reached the ship at 3:30 pm, just 22 hours overtime. We didn’t get a thing for it and it was the best time I have had in a long while. We intend to go back to Kastelstari again if we ever get the chance. 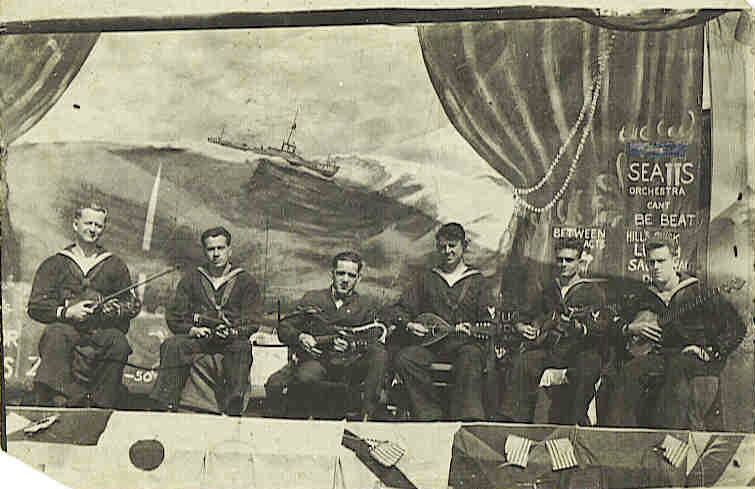 Photo caption: "Aboard the H.M.S. Zrinyi, Port of Spalato, January, 1919. The renowned orchestra boasted of a trap drummer also until three hours before the curtain rose. Then the Jugo-Slav Orchestra decided to have a concert so we had to send the drummer back." Courtesy of Woody Hughes.